How to convert string to int or integer to string in java? When we are working on a project we will be having some scenarios of expecting a string from int or integer from string. Now we will be discussing on how to convert Integer to String in java with example java programs. 2.Convert Integer to String using String.valueOf() method. 7.Convert Integer to String / int to String directly by adding to ""
8.Convert Integer to String / int to String using Special radix. Integer is a wrapper class in java which is mainly used to represent or convert primitive int value to object. And Integer class having some predefined methods. toString is a static method in Integer class so that by using class name itself we can call that method to convert Integer to corresponding string value. Integer class have toString() method to convert integer to string value same way String class also has valueOf() method to convert int or integer to string. String class has a static method valueOf() which takes int as argument and converts into string. 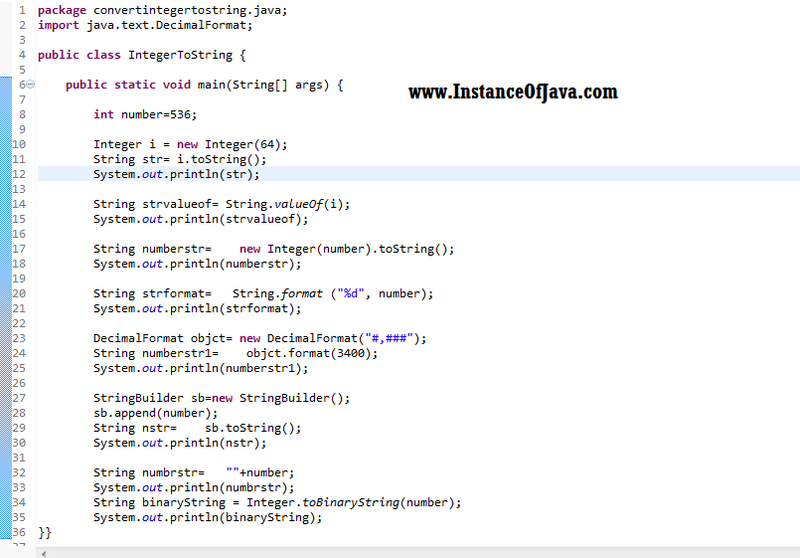 Program #2: Java Example program to convert int to string using valueOf() method. And here by creating Integer object and directly calling tostring method. Another alternative way to convert int t string is by calling String.format method. DecimalFormat class mainly used to represent numbers in formats. Decimal format class providing format() method to convert int to string with specified format. 7.Convert Integer / int to String directly by adding to ""
We can convert a number to string simply by concatenating to "". But it is not recommended to use. Program #7: Java Example program to convert int to string by concat to ""
8.Convert Integer / int to String using Special radix.